Sunny Days Events will sponsor the first annual Midsummer Night Charity Ball June 22nd. This elegant dinner is a formal gala that will support various youth art programs around Juneau. The Midsummer Night Charity Ball will have performances by Juneau String Ensemble, TAFY, Emily Smith and Rebekah Grimes. It will be DJ'd by Rich from K-Magic productions and be catered by Mark Collier and Dan Vespa from the Timberline Bar and Grill. All guests will be entered in a drawing to win an original oil painting by Louise Miller. 2013 proceeds will support TAFY and Juneau String Ensembles. Jessica Snyder, Owner of Sunny Days Events, grew up participating in Juneau school-based arts and entertainment programs. The arts have always been important to her and as she has seen arts budgets being cut around the country she fears the arts will become available only to those who can afford them. By hosting the Midsummer Night Charity Ball, Snyder is hoping to help lower tuition or provide scholarships to students who otherwise would not be able to afford such programs. Sunny Days Events is a new wedding and event planning company. Jessica Snyder, owner and coordinator, has always loved throwing and planning parties. She has been criticized for going overboard, but she believes we don't have enough reasons to breakout from the normal -- so when you do, why don't you go big? Sunny Days Events has packages for brides who require limited help coordinating vendors or other details as well as for hosts who want a little more help for their event. Snyder is hoping to debut her event planning talents to Juneau with this annual charity event. 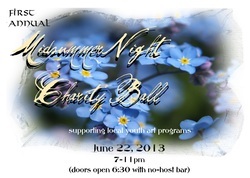 The first annual Midsummer Night Charity Ball will be held June 22, 2013, 7-11pm at the Cathedral of the Nativity, St. Ann's Hall with tickets sold for $75 a seat or $400/table of six. The event will end by 11:00 so you may doff your ballgown and don your Only Fools Run at Midnight outfit or simply change your shoes and hit the road.